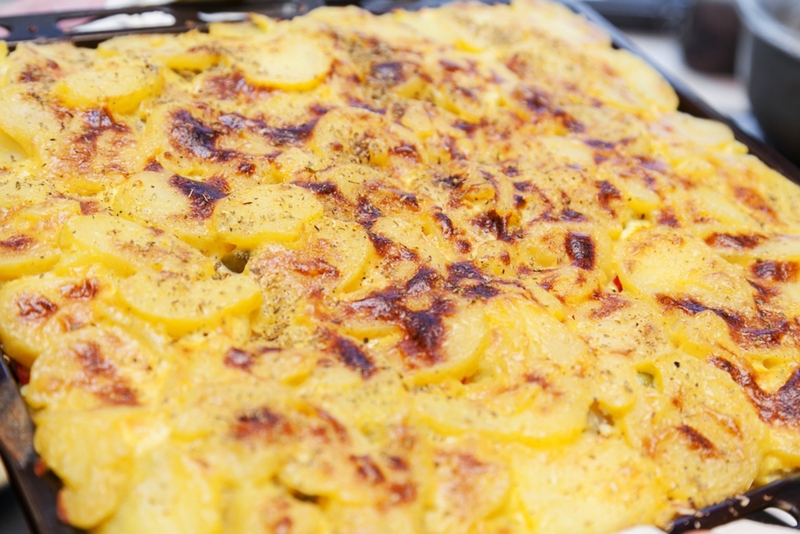 If you like traditional potatoes gratin, take it from us, you’re in for a real treat with this super scrumptious version! We’re not sure you could ever really go wrong with gratin, but the combination of honey and Dijon in this particular recipe, along with the Swiss cheese, (or gruyere! ), knocks the flavor out of the park! If you want to impress your guests, this is definitely one to pull out of your pocket at the next get-together or family gathering – just be sure to dish up a portion for yourself before it’s gone! (We learn these lessons the hard way in our house.) Trust us – you won’t be sorry you tried this delicious spin on the original recipe! Preheat oven to 375º F. and grease a shallow, 2 quart baking dish. In a large saucepan, over medium heat, combine honey, mustard, heavy cream, thyme, salt and white pepper. Stir until well combined and sauce begins to slightly thicken, then add potatoes and onion. Continue stirring until it reaches a simmer. Transfer to baking dish and sprinkle gruyere over the top. Bake 1 hour and 15 minutes, until potatoes are fork tender. Remove from oven and let sit for 15-20 minutes, until the sauce cools enough to slightly thicken. Serve and enjoy!